The Grade 2 “mood” is one of contrasts. There’s a settling in to the new world of challenges and learning begun in Grade 1, accompanied by a certain restlessness. As boundaries are tested, there’s a desire to take on more, which can be expressed as a somewhat overly confident rambunctiousness. This quality is reflected in the Aesop’s Fables’ brashly bold animal characters, as they repeatedly test any and all boundaries. So here we have the perfect fit for the typical 8 year old, a way of “laying down the law,” palatable and effective and understandable. Grade 2 is an optimal time for sowing these deeply pedagogical seeds, so they later become the basis for a mature, caring sense of responsibility. Fables are endearingly entertaining as well. Brevity and conciseness underscores their effectiveness, so their messages are easily heard and retained. In addition to the moral that follows the story, the animals’ rambunctiousness nicely echoes the 8-year-old’s unruly thread of high-spirited boundary testing. After telling the story, “The Lion and the Mouse” in which a tiny mouse proves his worth to the mighty lion by gnawing at the strings of the net used to capture the lion, thus freeing him, elements of the story are used to teach (and illustrate!) the square numbers. After telling the story, “The Grasshopper and the Ants” use elements of it to illustrate a movement done large on the floor with a number line, showing patterns found in the 3 and 7 tables. 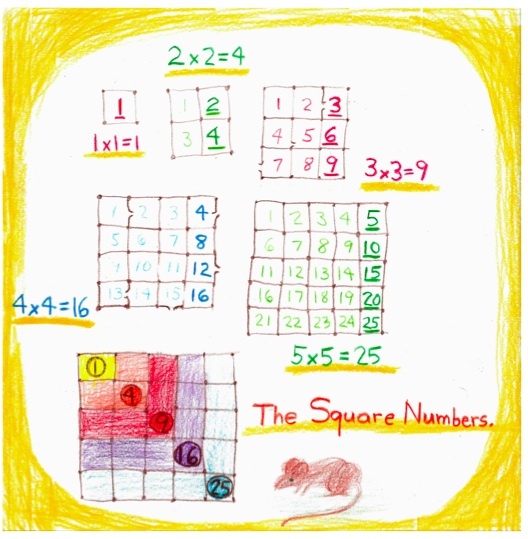 The Math By Hand curriculum provides all the details needed to access this, along with many other ways to combine fables with math lessons. In stark contrast to the animals’ mischief-making, the legends of saints and heroes paint inspiring portraits of men and women whose lives have made a difference in our world. This contrast of the beastly with the saintly can help to balance polarities your child(ren) may be experiencing at this age. “Saint Francis and the Wolf of Gubbio” is a wonderful example. Perhaps no other saint is as appealing to children as St. Francis, with his affinity for animals and peaceful, compassionate nature. Find many stories like this one, of exemplary men and women of all times and cultures online or at your library, and share their legendary lives with your child(ren). Your efforts will reap many and varied benefits and rewards. Though not as directly applicable to math lessons as the fables, the saints and heroes tales provide an essential counterbalance to the animal tales in their inherent goodwill and compassion, while imparting valuable life lessons. Recognize then the value of stories to any curriculum, including math, and be sure to always include them, along with art and movement.